Bien me sabe is a delicious Venezuelan dessert—a rich coconut cake with layers of cream and meringue. The name translates to "tastes good to me" (a good little grammar lesson for anyone studying those tricky Spanish reflexive verbs). This cake is similar to tres leches cake in that it is served chilled and is extremely moist, sweet, and rich. You can prepare this cake using a cake mix to save time, or use your favorite white cake or sponge cake recipe. Bien me sabe is best if allowed to chill overnight, so plan ahead if possible. Preheat oven to 350 degrees. While oven is preheating, spread 1/2 cup sweetened dried coconut out in a cake pan and place in the oven to toast. Check coconut frequently and stir occasionally so that it toasts evenly. When it has toasted and is golden brown, remove from oven and set aside. Prepare cake: Mix cake mix according to directions. Line a 9 x 13-inch pan with wax paper. Pour batter into the pan, and bake according to package directions. Remove cake from oven and cool completely. Prepare coconut cream pudding: In a medium saucepan, bring the cream of coconut, milk, and salt to a simmer. While the milk is heating, whisk together the egg yolks, cornstarch, and sugar in a separate bowl until smooth. When the milk starts to simmer, remove from heat and pour about a cup of the hot milk into the egg mixture, whisking quickly to mix. Pour the egg mixture back into the saucepan, and return to the stove. Cook over medium-low heat, stirring constantly until cream mixture starts to thicken and come to a boil. Remove from heat and let cool. Stir in the vanilla, cover the surface of the coconut cream with a piece of plastic wrap and chill for at least an hour or two. Once the coconut cream is chilled, whip the heavy whipping cream in a bowl until soft peaks form. Whisk a cup of the whipped cream into the coconut cream to lighten it, then fold the remaining whipped cream into the coconut cream. Chill until ready to assemble the cake. Prepare simple syrup: Bring 3/4 cup sugar and 3/4 cup water just to a boil. Remove from heat, let cool, then stir in the rum. Prepare meringue: Place egg whites in the (very clean) bowl of an electric mixer, and attach the wire whisk. Place the sugar, 1/3 cup water, corn syrup, and pinch of salt in a small saucepan, and bring to a boil. When the temperature of the sugar syrup reaches about 240 degrees Fahrenheit (115 degrees Celsius), or after about 3 minutes, turn on the mixer and start beating the egg whites. When the temperature reaches 248 degrees Fahrenheit (120 degrees Celsius), remove the syrup from the heat. The total cooking time is about 4 minutes, and the sugar syrup should make thin threads if you drizzle it off of a fork, and will have thickened. The egg whites should be forming stiff peaks. Slowly and carefully pour the syrup down the side of the mixer bowl, into the beaten egg whites. Continue to beat the meringue until it cools, about 5 minutes. Fold in 1 teaspoon vanilla and 1 teaspoon rum if desired. Assemble cake: Remove cake from pan, and slice cake in half horizontally into two layers. Spread half of the coconut cream mixture on the bottom of the 9 x 13-inch cake pan. 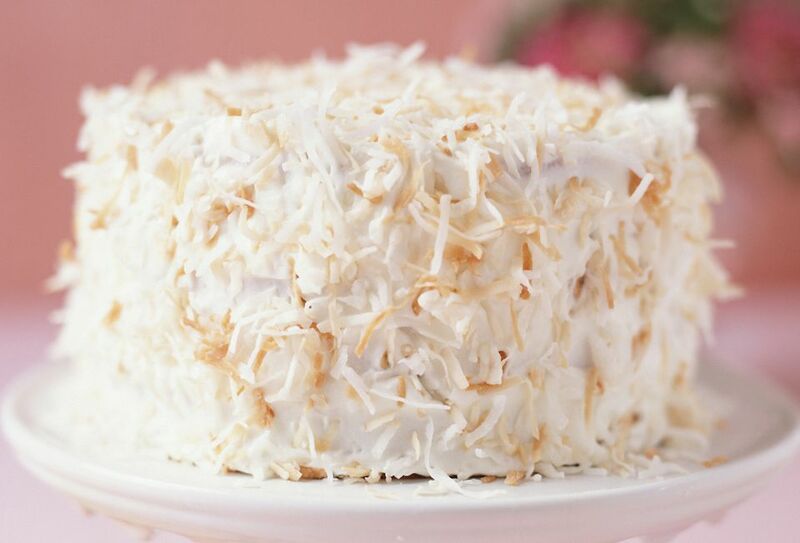 Place one layer of cake on top of the coconut cream. Use a pastry brush to moisten cake with some of the syrup mixtures, then sprinkle cake lightly with cinnamon. Spread the remaining coconut cream on top of the cake. Cover cream with second cake layer. Moisten cake with syrup and sprinkle with cinnamon. Top cake with meringue mixture, using a spoon to swirl meringue decoratively. Turn on oven broiler and carefully brown the top of the meringue under the broiler (for just a minute or two, not too close). Sprinkle top of cake with toasted coconut. Chill cake several hours or overnight before serving.